“How low can you go?”… Limbo is a popular party game that originated from more humble beginnings on the Caribbean islands. Now, the game may be most familiar to those who have played it at a Luau, gym class or a birthday party or family gathering. You asked for it, so we got it! An inflatable version of our \Giant Twister\ that is a hit for all ages. The 15' x 15' inflatable version of Twister adds a new dimension and degree of difficulty to this classic game. Giant Plinko is a very versatile game that can be made as difficult as you would like. Watching the puck slide and bounce on the game board is fun for all ages. Arm yourself with the giant foam padded battle stick and attempt to knock your opponent off their pedestal. The loser lands on a giant inflated mat while the winner towers above in victory. Do you have good aim? I hope so, because we have one hungry gorilla. Toss bananas to our hungry gorilla to keep him in his cage. All ages. Yep, it's the real deal, straight out of the arcade! Our 100% real arcade Guitar Hero allows 2 players to go head to head in this favorite guitar game of all time. 2 sets of horseshoes used for tournament play or leisurely fun. Adults and teens will enjoy using skill and speed to race the floating balls to the end of the track. This unique game is perfect for casino parties and \grown up\ parties when you need group participation and lots of laughs. 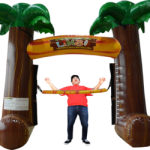 Just when you think you have everything for a party that you need, you see and know you need our Tropical Themed Inflatable Bar with the big palm trees. This is a real bar and is perfect for making and serving smoothies, snow cones, adult beverages or just about anything you can think of. Our unique inflatable bar is guaranteed to be the talk of your party. Jaws has returned! You just thought the Mechanical Bull was fun, wait until you try to ride Jaws, \The Great White Shark\! Nothing but fun as you climb onto our replicated shark and try to hold on for the ride of your life. Jaws is a blast to ride and just as much fun to watch as everyone takes a turn get your camera ready! Do you want a real swing ride that goes high and fast? Then you need the 20 seat Jitterbug. Around and around, the Jitterbug is a very fast paced ride for the more adventurous crowd. The Jitterbug is a timeless classic that is sure to please everyone. Height requirement of 42'. Children just can't wait for the journey back in time on the ultimate prehistoric playland. Enter through the ancient dinosaur bone yard, then use ropes to guide your feet up the rocky terrain of the raging volcano. If you can't take the heat, take the fastest route to the bottom on the 10 foot dueling slides. Then, ride the two rock'n dinos and slam the tall dinosaur pop up heads. It's an adventure that you'll never forget! As if the circular two person obstacle course was not tough enough, we have thrown in the rotating "Boom of Surprise" to really make this obstacle course interesting. Nothing like beating your friend only to be taken out of contention, watch out! Designed for guests 48" and taller. A smaller moonbounce for the smaller kids with beach and ocean theming. This fantastic bounce will fit in a standard height room! Toss the ball and try to guess what color the ball will come to rest on. A 1 in 8 chance of winning keeps your guests always coming back for more. All ages. You have seen it at the Fair and now you can have it at your next event! The Ladder Climb is a classic midway game and is a challenge for all ages. It looks easy, but wow is it hard to climb to the top. When you fall a giant cushion of air is there to catch you. Safe and fun for all!